The debate over whether the Net is good or bad for us fills the airwaves and the blogosphere. But for all the heat of claim and counter-claim the argument is essentially beside the point: it's here; it's everywhere. The real question is do we direct technology or do we let ourselves be directed by it and those who have mastered it? "Choose the former " writes Rushkoff "and you gain access to the control panel of civilization. Choose the latter and it could be the last real choice you get to make." 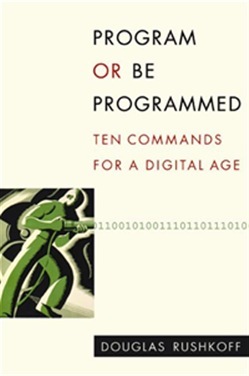 In ten chapters composed of ten "commands" accompanied by original illustrations from comic artist Leland Purvis Rushkoff provides cyberenthusiasts and technophobes alike with the guidelines to navigate this new universe. Acquista Program or Be Programmed in Epub: dopo aver letto l’ebook Program or Be Programmed di Douglas Rushkoff ti invitiamo a lasciarci una Recensione qui sotto: sarà utile agli utenti che non abbiano ancora letto questo libro e che vogliano avere delle opinioni altrui. L’opinione su di un libro è molto soggettiva e per questo leggere eventuali recensioni negative non ci dovrà frenare dall’acquisto, anzi dovrà spingerci ad acquistare il libro in fretta per poter dire la nostra ed eventualmente smentire quanto commentato da altri, contribuendo ad arricchire più possibile i commenti e dare sempre più spunti di confronto al pubblico online.